A woman who thinks her baby was stolen at birth in Spain has travelled to Madrid to join MEPs investigating a raft of similar claims. 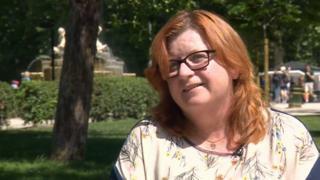 Ruth Appleby was told her daughter died after she gave birth in 1992 but later learned thousands of Spanish babies were taken and given up for adoption. The EU delegation say they will speak with various officials about what could be done to reunite those affected. MEP Jude Kirton-Darling said there needed to be a "full investigation". Mrs Appleby, from Catterick Garrison, North Yorkshire, gave birth at a hospital in La Coruna in northern Spain where she was living at the time but the following day was told her child had died. When she returned to the UK in 2010 she had her daughter's remains exhumed for cremation but said the skeleton she saw in the coffin appeared to be that of a much older infant. Her case was then referred to the Spanish authorities, but she was unhappy with their handling of it and petitioned the European Parliament. The practice began in the late 1930s under the fascist regime of dictator General Francisco Franco and was aimed at removing babies from families deemed "undesirable"
Mrs Kirton-Darling, a member of the European Parliament's Petitions Committee, said: "Ruth's case is absolutely crucial. It is the lynchpin of why we are here in Madrid. "What we are talking about is a serious crime and it needs to be investigated as a serious crime. "What happened to her child we cannot know until the evidence comes out. "What we need is a full investigation to try and establish what the actual facts were." Speaking to the BBC, Mrs Appleby said had she known her child may not have died she would have "moved heaven and earth" to find her. "Even though she won't know the name she was given; Rebecca, you have always been very loved and you have a family who are just dreaming of the day they can welcome you in to our hearts and complete our family."